Lip color, whether it’s in gloss, stick or tint form, makes me most happy when I can apply it without a mirror. Happiness is also achieved when I can do two things at once, like make my lips look better while protecting them from the sun. I didn’t realize Hemp Organics would be the giver of such good cheer in my life when I impulsively grabbed two lip tints and tossed them in my grocery basket a couple months ago. Oh, and did I mention they are $5.99 each? First, let’s check out the ingredient list: Organic jojoba oil, organic hemp oil, candelilla wax, carnauba wax, organic olive oil, castor oil, vitamin E, mica, iron oxides, titanium dioxide. (Vegan lip tint colors, those without carmine are: Terra, Amber, Earth and Kiss). Three cheers for such a short ingredient list on a makeup item, one where you actually recognize every word! Titanium Dioxide might not be entirely familiar to everyone, but it is a natural, physical sunblock that provides Hemp Organic Lip Tints with their SPF of 15. I bought Berry and Wine as I am partial to neutral reds and I get the most use out of Berry. Berry is a true rosy red, not too pink or brown that requires no mirror to get the application right. Wine is a richer red and actually works as an evening color. The lip tints make your lips slightly glossy and glide on like an ultra-smooth Chap Stick. They are unscented, feel really nourishing and are tiny little things so they fit nicely in a small purse or pocket. 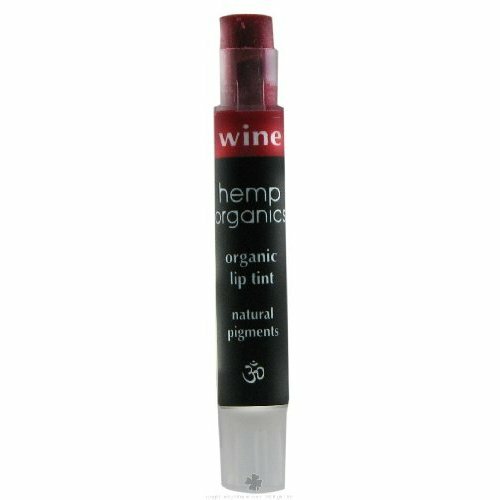 Hemp Organics Lip Tints are available at most health food stores and VashonOrganics (whose color descriptions aren’t very accurate, IMO). Next Post The winner of Tallulah Jane's Tallulah is.. These sound great, Trish. I am looking for a new lip tint, and I do prefer the natural products. As pale as I am, surprisingly, a clear rosy red applied lightly looks good on me, so I’ll try the Berry. Anya, Berry would be good then. It’s a rosy red with just the prettiest hint of pink. I love it! Let me know what you think if you do get it! I swatched some of the lip tints at Whole Foods and I fell in love with Berry; it’s the perfect cherry rose. And it’s glossy, too! But, surprisingly, I didn’t get much color pay-off from Wine. It showed up as a weak, shimmery pink on my inner wrist. I also tried Love, which is a subtle hot pink and Kiss, a light, golden mocha. Berry’s the only one I liked, but they were out! 😡 Do you know any other stores where the lip tints are available? Berry is my favorite too, that’s too bad they were out. There’s a local health food store in my neighborhood that carries it, so you might just want to call around. Also, Whole Foods is very good about ordering things for customers, you should ask them.